Chelsea Bentley, Aubrey Jacobi, Lauren Jones, Gina Pottkotter, and MegAnne Punt from the Bellarmine University Physical Therapy Program's Pathophysiology of Complex Patient Problems Project. Chief Complaint: Patient presents to outpatient physical therapy clinic (2 months post discharge), with desire for further prosthetic training. Patient’s prior outpatient PT included gait training and stair training with use of cane. Now, patient desires more independence without assistive device and further training to accommodate his increased activity level in the community with his volunteer work. Patient notes that he feels increasingly tired after a day of volunteering, therefore he wants more endurance training with his prosthetic. Upper and lower quarter screen ROM WNL. Hip flexion 4-/5 bilaterally, Shoulder abduction 4-/5 bilaterally, shoulder flexion 4-/5 bilaterally. All other manual muscle tests within normal limits. Following evaluation, the patient presents with signs and symptoms consistent with proximal muscle weakness. Patient demonstrates diminished sensation in bilateral lower extremities. The patient presents with increased fatigue, headaches, and adventitious breath sounds consistent with possible infection. The patient’s 5 Time Sit-to-Stand outcome measure indicates decreased ability to perform ADLs due to fatigue. Additionally, Mr. Bert’s AMP score indicates the ability to perform most activities, but the patient’s self-report demonstrates limitation due to restricted endurance. Due to the patient’s risk factors of diabetes and age coupled with enlarged spleen upon palpation and tenderness, physical therapy recommends referral back to the primary care physician for further evaluation and blood work. The clinical impression of this patient is that the proximal muscle weakness and increased fatigue are consistent with presentation of acute myeloid leukemia.The patient will be referred back to his primary care physician. The patient would benefit from physical therapy to strengthen proximal muscles and increase cardiovascular endurance. Since the patient will be undergoing concurrent cancer treatments, the main focus of the interventions will be aerobic and strength training along with pain management, when necessary. Physical therapy treatment sessions will be symptom dependent and it will be vital to monitor the patient for signs of excessive fatigue. The patient should also be monitored for chemo-induced neuropathies, which could put them at a greater risk for falls. •Aerobic training – Current literature shows that walking for at least 12 minutes, five times per week for 3 weeks at a pace that would get them a heart rate of RHR+30bpm. This prescription is sufficient to maintain the cardiovascular system and alleviate symptoms of fatigue, anxiety and depression. •Strength training- Strength training twice a day, 3 times per week, for 10-30 minutes at 40-50% of HRR has been shown to decrease fatigue and depression in patients undergoing chemotherapy. Upper and lower extremity resistance exercises should be used. •Combination of strength and aerobic training – It is important to include both types of exercise into a patient's regimen. A combination helps to combat the effects of bed rest and deconditioning, which are common with patients undergoing chemotherapy. •Pain Management –Hot/cold packs, TENS, and massage are all modalities that can be used to decrease pain in patients. After completion of a 6 week aerobic and resistance training the patient should show improvements in physical endurance, as well as aerobic fitness with improvements in peak VO2, and increases in muscle strength for both upper and lower extremities. At the end of the 6 weeks the patient should also have an increase in body weight, with a decrease in body fat. This is crucial, as most AML patients lose weight throughout the disease process and chemo sessions. It is important for the patient to not only gain weight, but to gain lean muscle mass instead of fat. The patient should also show significant improvements in global quality of life, fatigue, anxiety, and emotional function, as well as improvements in depression. The patient may also experience a decrease in pain, through the use of heat/cold packs as well as pharmaceutics. This case study displays a cluster of red flag symptoms that cannot be overlooked in any patient case. What appears to be a simple patient in need of prosthetic training, turns out to be a far more complex case. This is a reminder to all practioners, including physical therapy in this case, to not just assume a patient is as straight forward as they initially appear. Through a detailed patient history, clinical exam findings, and a knowledge of red flag symptoms, the physical therapist is able to ascertain that the patient needs a follow up by a primary care physician. Also, this case displays the need to understand co-morbidities and risk factors. The patient, Bert, has a history of diabetes and smoking, which are risk factors for numerous conditions. Instead of seeing Bert just as a patient with a prosthetic limb, one must not forget that the reason he has a prosthetic is becasue of his diabetes. When you combine this history, increased fatigue, petechiae, proximal muscle weakness, and enlarged spleen, the physical therapist is able to refer for further testing. With the increae in direct access patients, it is imperative that physical therapists perform a thorough evalulation. If the physical therapist would have taken Bert as a patient in need of endurance training, and not performed a full evaluation, a physcian referral would have been missed, and his case of acute myeloid leukemia could have easily been overlooked. To provide the highest quality care, this case reminds everyone within the healthcare spectrum that quality knowledge and appropriate referral is needed to maintain the highest patient care. ↑ 1.0 1.1 1.2 1.3 1.4 Mooney, K and Rice, E. Acute Myeloid Leukemia [Internet]. Physiopedia [cited March 3, 2015]. 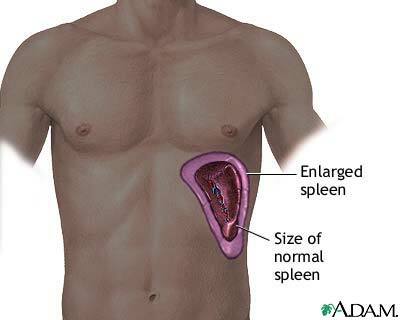 Available from: http://www.physio-pedia.com/Acute_Myeloid_Leukemia. ↑ SF-36.org [Internet]. Available at: http://www.sf-36.org/demos/SF-36.html. Accessed March 3, 2015. ↑ Gailey RS, Roach KE, Applegate EB, Cho B,Cunniffe B, Licht S, Maguire M, Nash MS. The Amputee Mobility Predictor: an instrument to assess determinants of the lower-limb amputee ability to ambulate. Arch Phys Med Rehabil 2002;83:613-27. ↑ Strengthening exercises: lower extremity exercises [internet]. 2013 [cited 2015 March 25]. Available from: http://www.columbialungtransplant.com/guide_e_lowchair.html. ↑ Rehab Measures: Five Time Sit to Stand Test. Rehab Measures Database Website. http://www.rehabmeasures.org/Lists/RehabMeasures/DispForm.aspx?ID=1015. Published June 20, 2013. Accessed February 17, 2015. ↑ 6.0 6.1 Diseases and Conditions: Acute myelogenous leukemia (AML) [Internet]. Mayo Clinic Website. 2012 [cited March 3, 2015]. Available from: http://www.mayoclinic.org/diseases-conditions/acute-myelogenous-leukemia/basics/definition/con-20043431. ↑ Chang PH, Lai YH, Shun SC, et al. Effects of a walking intervention on fatigue-related experiences of hospitalized acute myelogenous leukemia patients undergoing chemotherapy: a randomized controlled trial. J Pain Symptom Manage. 2008;35(5):524-34. http://www.ncbi.nlm.nih.gov/pubmed/18280104 (Accessed March 23, 2015). ↑ Battaglini CL, Hackney AC, Garcia R, Groff D, Evans E, Shea T. The effects of an exercise program in leukemia patients. Integr Cancer Ther. 2009;8(2):130-8. http://www.ncbi.nlm.nih.gov/pubmed/19679621 (Accessed March 20, 2015). ↑ Alibhai SMH, O’Neill S, Fisher-Schlombs K, Breunis H, Brandwein JM, Timilshina N, et al. A clinical trial of supervised exercise for adult inpatients with acute myeloid leukemia (AML) undergoing induction chemotherapy. Leuk Res. 2012;36:1255–61.